There is nothing better than having a big family celebration, get-together or special event. It's a wonderful opportunity to bring together some of the people you love most in the world, but who don't always get a chance to spend time together for a variety of reasons. Many of us have family who live far away from us or who, due to work or personal commitments, are not always free to visit us at a moment's notice. So when an opportunity comes along to get all the family gathered together to celebrate an event such as a special birthday, anniversary, christening or even a wedding, it provides us with a golden opportunity to hold an event which we will remember always and the memories of which will live on, long after the event has passed. At least, that's how it's supposed to go... The reality is that while family events are terrific fun and something to be looked forward to, they can also cause a lot of anxiety and stress to the person whose job it is to organize the event. If birthday parties, anniversaries or weddings are not well thought out, carefully planned and superbly organized from the very beginning, they can often end up being emotionally draining and make the organizer wish he or she could wave a magic wand and disappear, leaving someone else to deal with all the stress. The great news is that there are a number of steps you can take to ensure that whatever family celebration you are organizing, it turns out to be the wonderful, happy and memorable event you've always dreamed of. Many people prefer to hire professional event planners who are impartial and are not emotionally involved. This can be a good way to minimize stress and letting someone else worry about the details while you can get on with the important things, such as spending time with loved ones and enjoying the run up to the event itself, is wonderful. However, the reality for most people is that it can be costly to hire an event planner and therefore they try to handle everything themselves, very often without much previous experience in organizing events. It always seems so simple before you start..."choosing the venue", "selecting the food and beverages" and "hiring the band" are the top three things people tell me are involved when planning a large family event, such as an important birthday or anniversary celebration, but very often event organizers don't consider some of the other important factors involved. I have written this article to highlight some of the main things you might need to focus on when organizing your own family event, which will help to alleviate and avoid some of the issues that can often arise. Working out your budget for any type of family event, but particularly for a wedding when costs can escalate very quickly and when there are so many different elements to consider, is the first thing you need to do. Without a budget in place from the very start, it is difficult to know how much you can spend and also where the money should be allocated. Decide at the beginning how much you have to spend on your event which will cover every aspect of the event I have outlined below and, once you have done that, put aside some "Contingency Money" for anything that either may go wrong, or any unplanned costs that may arise, such as paying for an extra family member or friend you may have left off the list at an earlier stage or covering the cost of extras such as gratuities, or even replacing any items such as gifts which may get lost or broken in transit. If your event is particularly large, you may even wish to take out special Event Insurance to cover you should anything go seriously wrong. I have come across situations where companies went into receivership, bands went bust and cake-makers went out of business and clients were left with no money and worst still, no goods. I've even seen a bride end up without her wedding dress due to her dress shop going out of business, so if your event is a large-scale one such as your wedding, you may need to allow for an extra cost such as Insurance. Even when you have absolutely everything covered and are sure that nothing can go wrong, things can sometimes happen which are completely out of your control, so it is vital to be prepared for this from a financial perspective. So you have set your budget and know how much you have to spend...now what? There are number of elements you will need to take into consideration, so the easiest way to do this is to go through each one separately. While this list of elements is comprehensive, it is not exhaustive and you may wish to add your own items along the way. What will work for one event does not always work for another, but if you can use the following Event Checklist as a guide you can at least ensure that you have covered as many elements as possible! Choosing a date sounds simple in theory, but can often be complicated particularly if there are various family members coming from different states or even different countries to your event. There are a number of ways to choose a date; if you have email addresses for your family members you could send out an email suggesting two possible dates and asking everyone to nominate their preferred date. This is particularly useful if you are planning a summer event when many people go on vacation. Another alternative would be to select a date yourself which is far enough in advance to give people time to make their plans and arrangements. 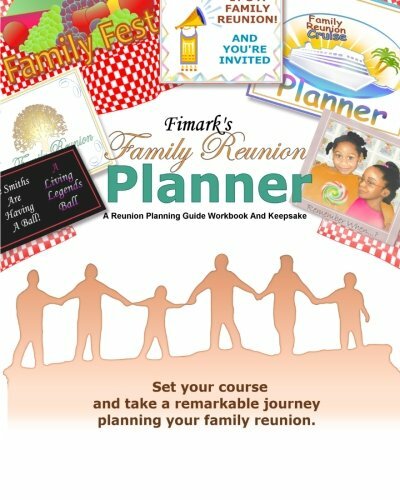 The one piece of advice I would give, is that if there are certain family members who absolutely must be there then you should aim to choose your date so that it fits in well with their existing plans. I would also recommend that you don't hold a large family event with any less than 3 months' planning in advance - smaller events (less than 50 guests) can be pulled together in a very short space of time, but if you have a specific location or a band in mind for your event then give yourself as much planning time as possible. Sitting down and writing your guest list can be lots of fun as it will get you in the right mood and you will start to feel the excitement about your event building. For some people however, making your guest list can be a stressful and often emotional time. As with all big family events, getting everyone together for what might be the first time in many years can be a truly momentous and joyous occasion. It is an opportunity to build bridges, to talk about the past, to lay ghosts to rest and to make the most out of what is often an all-too-infrequent family get-together. For some however, it may be a difficult time; feuding family members and family disagreements which are rooted in the past can often rear their ugly head and opens all sorts of old wounds and painful memories. However, if done correctly, there is a way to write and plan your guest list and deliberately avoid opening the door on disagreements and difficulties. First, write down the guests who absolutely must, without question, be at event. While this is a predominantly family occasion, you will also wish to invite some friends along, but I would suggest you make two lists - one entitled "Family Guests" and one entitled "Friends and Other Guests". I find it useful to use a typed spreadsheet for this as it almost gives a more formal tone to the process and can actually help you to be more objective when it comes to crossing people off the list. Once you have an idea of numbers you can then proceed to choosing your venue. You may find a venue that has the "wow" factor and is an ideal place to hold your event, but costs may also have a bearing on how many guests you invite. If you have written 100 guests on your list, but your chosen venue gives you a basic per head cost excluding champagne, wine or any extras and this is out of your budget, this may affect the number of guests you ultimately invite to your event, so it is always a good idea to write your guest list before approaching a venue to make an enquiry about prices, as the first question a hotel or restaurant will ask is, "How many guests?" Deciding on and booking your venue as early as possible is essential. You may wish to visit 3 or 4 locations before you eventually settle on the right one, so set aside a day on which to do this if at all possible. By allocating time to choosing your venue, this will help you not only to choose the right venue, but to ensure that you are getting the best value for money. It is also easier to compare each one with the other if you have allocated a specific block of time to this as if you visit on different days it is very easy to forget certain aspects of each visit and it can often leave you wondering things such as, "Was that the hotel with the great Reception area or was it the one who said they could do the table decorations for nothing?" These can seem like small things, but if your budget is limited then a venue which offers free extras such as table decorations, a welcome drink for your guests on arrival, a discounted room rate for any guests staying overnight. Likewise, if hospitality and good manners are important to you or your guests (particularly if you have older guests such as grandparents, or great-aunts and uncles) then a hotel with a great Reception area, welcoming Receptionist, helpful staff on hand to assist you on the day or a Banqueting Manager who really knows what they are doing could be something that will entice you to choose one location over another. You may also decide, weather permitting, to have an outdoor event such as a barbeque or marquee, however many larger hotels and country clubs should be able to cater for this. Even so, it is worthwhile doing your research in advance to avoid disappointment and allowing plenty of time ahead of your event to find and book your chosen location. I know of one case where one family had their heart set on a barbeque in a country club located amidst the most beautiful, peaceful countryside. They specifically wanted to have an outdoor party as they wanted an extremely relaxed event which allowed family members with children to be able to let their children run free and have as much fun as possible. Upon inquiry (and after discounting other alternative venues which subsequently became unavailable), the country club told them it was against hotel policy to erect a marquee on the grounds and they could only provide an indoor setting for the event. Eventually, after 6 weeks of searching, the family found an alternative location but because the booking was so last-minute, they left themselves with very little time to issue invitations, arrange flights and accommodation and other details. Catering for Lunch or Dinner (whether it is a formal sit-down event, a more relaxed buffet or a barbeque). In particular think about any of your guests who may have special dietary requirements or allergies. Decorations and Room Style - do you have a special color scheme in mind or are there any particular requirements such as floral displays, candles or lights? Do you require a dancefloor and will there be music either before or during the meal, or a band afterwards? Is there any other entertainment required such as a magician or face-painter for the children? Are there any guests who have special needs, such as those who may be in a wheelchair and might need special access or access to a disabled bathroom? Will you require a bar facility in the room? Ideally for most large occasions, you should issue your invitations no less than 6 weeks before an event, however I would recommend that once you have chosen your date and even if you do not have everything organized, you should send out a "Hold The Date" email or card to everyone to let them know that you are planning to host an event that day. This will give guests an opportunity to make alternative plans or arrangements if necessary and is particularly useful for anyone who has to travel from far away and needs to book flights or accommodation. As acceptances arrive, you can keep a note of these on your original "Guest List" spreadsheet. I would recommend that you update your spreadsheet on a daily basis. A client of mine had recently organised a surprise birthday party for a family member, but she had not kept track of emails, phone calls she had taken from people declining or accepting, or text messages received and I was called in at the last minute to try to figure out who was and was not coming to the party. If you can keep track from the beginning it will make life so much easier later on! An RSVP card to enable people to reply by post if they wish. On the Invitation Card itself you should offer your cell phone/mobile number, your email address and postal address and you should include a date by which all responses should be received. Inevitably, there will be people who call you right at the last minute to confirm they are coming and also those who will either call to say they cannot make it or, as happened to another client of mine recently, just not show up at all! You may find that the numbers who drop off and those who accept at the last minute usually balance out, but allow for extras just in case. Also, most hotels have a policy where catering must be paid for even if people do not show up, so ask your hotel to confirm their policies to you in writing beforehand. All too often when organizing a family event, it is so easy to become stressed out and worried...will our guests enjoy it? Will everyone get along? What if people don't show up? Will everything run smoothly without any disasters? These are very common worries when you have arranged a large event. It is normal to feel stressed and worried, particularly when there are so many things to organize at once. Your guests are coming to your event without any pre-conceived ideas. They are coming to see their family and friends, spend time with loved ones, reminisce about the past and talk about the future and of course, to have a great time. Remember the object of the exercise; to get together and have fun. It is easy to get swept along with small details and you will naturally want everything to run smoothly, but if you can relax and have fun then your guests will too. They will take their lead from you as the organizer, so be as relaxed as possible on the day itself. Time flies, so savour every moment of your special occasion. Whether you have thrown a party for your parent's wedding anniversary, your son or daughter's birthday or even for your wedding, try to enjoy every moment of the day or evening. It will go by so fast! Engage the help of a trusted family member or friend to carry some of the load. Don't try to do absolutely every single thing by yourself. If there is someone you trust to look after a few details then do it. Delegation is a sign of a great organizer! Take a little time to just be by yourself in the run up to the event. Have a massage, go for a run or a swim, or have a coffee and a cake somewhere quiet and peaceful. People often forget how hectic it is to organize a family event and how much there is to do, that they can often forget about looking after themselves, so make sure you get lots of rest before the day of the event. Finally, I hope your event is a wonderful success and that it is a terrific opportunity to reconnect with family and friends who you don't often get a chance to see. And whatever occasion you are celebrating, have fun, relax and enjoy every minute! 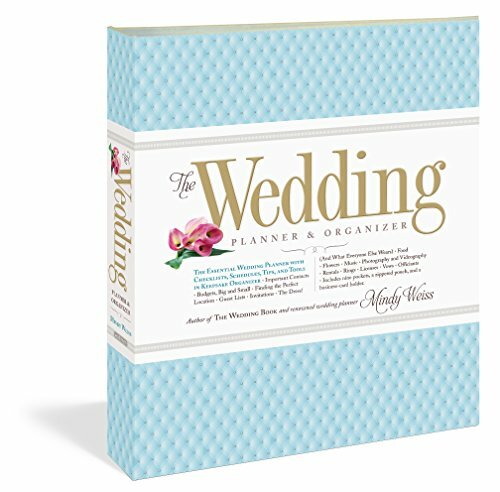 If you are planning your Wedding, then this is a super ringbinder to gather all your information before the big day arrives. Want to know a bit more about event planning? 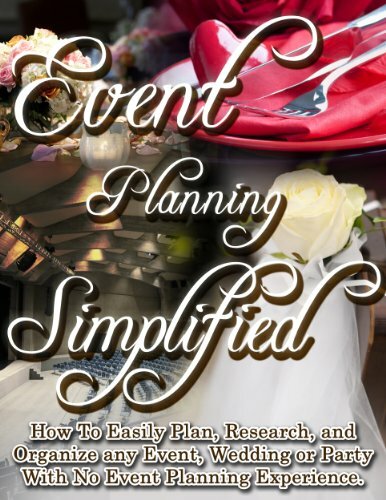 Then this book is an in depth, comprehensive guide to planning any event.